3/14/2016–MCAS Cherry Pt., NC–The 7th annual Ranger Training Weekend was held on 19-21 February 2016 at Morrow Mountain State Park, Albemarle, NC. C/MSgt. Blaise Thibodeaux, C/Amn. Maggie Thibodeaux, C/Amn. Chadwick Carreiro, and C/Amn. Joseph Carreiro from the Cunningham Field Composite Squadron participated in the event in order to obtain their Ranger 3rd Class basic qualifications. During the weekend cadets and senior members sharpened their SAR skills during both nighttime and daytime operations. Activities included compass and navigational work, map reading, and long-range hikes with 24 hour packs. ELT sorties, medical treatment skills, and physical fitness runs were also a part of the weekend training. Participants from all over North Carolina, and as far away as Florida, Tennessee, and Delaware began arriving on Friday afternoon. 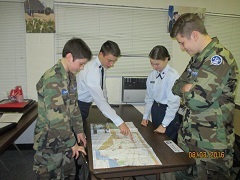 During check-in training weekend leaders assigned each cadet to separate squadrons. After joining their squadrons, cadets set up their shelter for the weekend and began acquainting themselves with their fellow squadron mates while gathering firewood. After a great meal of hotdogs and macaroni and cheese, cadets and senior members gathered around the campfire for classes. Saturday morning, squadrons woke early for PT and breakfast. The focus of Saturday’s training was basic search and rescue skills taught while hiking the mountain. Classes in rope tying and tree flagging following the evening mess.